Summary: A common concern in the comments expresses fear of resource exhaustion, perhaps even leading to collapse of civilization. Here we examine the theory, evaluate the risks, and point to sources of more information. It is a popular idea among degrowth people and some sections of the Green movement and of the far left. My last girlfriend was very much into it, and it definitely is a bad idea … The main reason for it should be obvious to anybody vaguely aware of the coming energy descent. Even its proponents acknowledge that the feasibility of a basic income system is highly dependent upon the continued existence of the industrial civilization. … The problem, of course, is that this future of robots automated factories shall never come to pass. It is not automation per se that fueled the industrial revolution and gave our society, but access to fossil energy. Without coal, oil or gas to fuel them and the highly complex social apparatus they need for their manufacture and maintenance, our machines are useless. 4 March 1999: Prepare for $5 oil! (b) We won’t run out of oil any time soon. Discoveries, however, have peaked in 1964 and are declining since. Production is plateauing since 2006 and will begin to decrease in the relatively near future. It certainly won’t be a cliff but a long and progressive descent. Alternatives won’t be developed, because there is none. The last breakthrough in energy (nuclear energy) happened during the fifties and was an economic failure. The other alternatives are low quality. (c) Industrial civilization needs a constant inflow of high grade energy ; Without it they will collapse, but that will take some time. We won’t have any instant Dark Age. What will happen is that we will be forced to replace high grade fossil fuels by lower grade « alternatives », which will result in cycles of steadily worsening economic crisis with periods of temporary recovery. According to the Meadows report, it should begin during the first decades of the XXIst century. (d) Don’t expect the Middle Age 2.0 before 2100, at the very earliest, and while we may lose a lot of technology, we won’t get back to medieval level. These things we discussed in several posts, even the extreme version (in Peak Oil Doomsters debunked, end of civilization called off). This post gives a brief reply to Perrotin’s concerns. In brief, we should worry about the consequences of peak fossil fuels. Bad luck (an early peak and fast decline) might mean a long recession or even depression. But we can prepare, and we can cope with the consequences. Preparation now minimizes the pain of the inevitable transition to new energy sources, and reduces the risk of a long and severe transition. Now for a look at the specifics Perrotin raises, focusing only on oil. UPDATE: Perrotin generously replied in the comments! Als0, consider subscribing to the FM website feed and Twitter feed (see the upper right corner). Yes, but the reason why is important. Using EIA data, liquid fuels consumption (which include non-oil sources) peaked at the start of the great recession, at 87.8 million barrels/day in February 2008 (as prices spiked). The combination of slower growth offset by OPEC production quotas AND the slow/sure response to 5 years of rising prices resulted in demand dropping. The trough in May 2009 was 87.9 mbd (-6%). A slow acceleration in GDP offset by continued efficiency gains brought demand back up to 2008 in July 2010, and to 89.7 mbd (up 2%) in February. Summary: consumption is flattish because of demand, not supply. Otherwise prices would be rising to destroy the excess of demand over supply (as it did in Spring 2008). Perhaps, but such confident predictions are not a good idea. First, there is insufficient publicly available information to forecast peaking with reasonable reliability. Data about the oil fields of many nations with large reserves is either sketchy & old (ie, Iraq) or secret (eg, Russia and most in the Middle East). And there are too many variables: economic growth, expenditures on projects to increase both supply and efficiency, and technology (eg, as fracking disproved the many confident forecasts of an imminent “cliff-like” crash in North American natural gas production. Which is why forecasts for peaking range from now through 2020 — and beyond. But there are people who know the answer: When will global oil production peak? Here is the answer!, 1 November 2007. Agreed! Data from fields and regions that peaked suggest a possible long plateau, followed by annual declines of 3 – 12% (depending on a wide range of factors). The worst-case: peaking in the next decade, a brief plateau, and double-digit decline rates — would be horrific (although not civilization-ending). The three forms of Peak Oil (let’s hope for the benign form) , 23 April 2008. Agreed! Most forecasts (eg, the large collection used by the IPCC to estimate CO2 emissions) estimate that we’ll reach the point at which we’ve used 90% of reserves (ie, recoverable using current technology) sometime in the late 21st century. That estimate is speculative for two reasons. First, what’s economically recoverable will certainly expand due to new extraction & refining technology. Second, see the next point. For an explanation of why peaking does not mean “running out” see this important post: Recovering lost knowledge about exhaustion of Earth’s resources (such as Peak Oil), 27 January 2011. Perhaps, but IMO that’s stating as a certainty something about which we can only guess. Also, that’s a astonishingly confident statement to make about technology over the next 50+ years. As you know, the history of such assertions is not pretty (although providing much laughter to later generations). It’s especially odd given the range of technologies under development. First, nuclear has great potential — despite its incompetent application so far. For details see the reports listed in the nuclear section on the Energy Studies page. Second, there are other sources — such as Coal-to-liquids — that have severe limitations (eg, dirty, expensive) but can help carry us from oil to better sources. Third, there are many promising research programs in fusion (see this article for an overview). Such as the Polywell invented by the great late physicist Robert Bussard (for more information see here and here). We can only guess which — if any — of these will prove feasible; none will have significant production during the next two decades. But during the mid-21st century during which fossil fuel shortages become serious they have great promise. What are the alternative sources under development? How long might it take until they’re in large-scale use? For a summary answer see Eventually we’ll have unlimited cheap clean energy. But that will not help us or our kids. For details about specific energy sources look here. Note that all of these require electrification of surface transportation. A National Academy of Sciences study (“Transitions to Alternative Transportation Technologies: Plug-in Hybrid Electric Vehicles“, December 2009) shows that this is feasible, although (like all large-scale capital projects) requires one or two decades to do economically (ie, not on a wasteful, panicked crash basis). When should we begin to prepare for peak oil? Today a world of knowledge — a world of cooperation – a just and lasting peace — may be years away. But we have no time to lose. Let us plant our trees this afternoon. Especially see the “studies and reports” page. On that is a link to the US Department of Energy’s Mitigations report by Robert Hirsch et al (2005), that discusses these things at length. Hirsch is IMO our (America’s) greatest living energy export. He saw this crisis coming in 2002 (before prices started their fast rise), but we didn’t listen. We’re still not listening. The world changed last week, with no headlines to mark the news, 25 April 2008 — The King spoke. Previous Post Europe has a political crisis. The economics are just symptoms. Does it matter whether oil becomes more expensive because of scarcity or because more complex and costly technology is required to extract the remaining resource? The net result is the same: “post-conventional” oil is too precious to use in the same energetically wasteful manner in which conventional oil was used to build out the current global industrial infrastructure and the economic ideas that go (went?) with it. To that extent, peak oil is already here. Hirsch’s original report warned that economies based on the 20th Century industrial model would need 20 years to manage a smooth transition to the approaching state of net energy availability from oil. They didn’t take the hint. Hirsch’s more recent book points to a 50-year time frame for energy transitions – e.g. from oil to coal/nuclear/fusion-based electricity. Again, very little discussion is going on about the biophysical economics of post conventional oil, which will surely make the transition process more unstable, and therefore more painful, than it might have been. The rapidity with which future oil energy diverts from car transportation to the production and distribution of food and goods will surprise some people. One major car manufacturer I’m aware of seems to have a long term strategy of becoming a boutique provider of high tech vehicles to governments, military, industry and the top 5% of consumers: the main remaining markets it foresees for newly manufactured vehicles in 30 years’ time. (a) The key question is slightly different, since “scarcity” is amgibuous. Are oil prices rising because of demand (increasing faster than supply) — or exhaustion of cheap oil? They are different phenomena, with different consequences for the future (the latter is more serious), although they are not exclusive. The 2008 price spike, to roughly $150, was mostly the former. The rise since 2002 mostly the latter. No, and that’s a vital point widely misunderstood. There is an inverse relationship for minerals between ore quantity and quality. Less higher grade, more lower grade — and lots of low grade. Graphically its a pyramid. So low grade oil reserves are massive, not precious. But its too expensive, hence exploiting these forces development of new sources. For details see Recovering lost knowledge about exhaustion of Earth’s resources (such as Peak Oil), 27 January 2011. No, it probably is not here. Otherwise prices would not be half of the 2008 peak. This is a vital point. The repeatedly false predictions of oil peaking (and during 2004-2010 of North Am natural gas peaking) have discredited peak oil theory among many leaders and much of the wider public. The PO community has displayed as near-total inability to critique itself, so that poor data, flawed logic, and general doomsterism have drowned out the voices of their best people (eg, Hirsch). They’ve become part of the problem. Yes. I too said that, at the end of this post. It might be one of the great examples of wasted advice. Like Taleyrand advising Napoleon to stop expanding after Austerliz. Obviously the easy-to-get oil is becoming more scarce; hence the requirement for extracting much more difficult oil and its unconventional, low EROEI sources. Yes post conventional oil is too precious to be used in the same wasteful manner the consumerist society has grown accustomed to. Besides its low EROEI, unconventional sources like tar sands create horrendous environmental damage, the effects of which cannot be overemphasized. Yes, peak oil is here, as defined in my essay ‘George Monbiot Clueless about Peak Oil’, posted at Collapse of Industrial Civilization, 4 July 2012. Faith-based doomsterism. This appears on all the threads about energy. No matter how much data is presented, the doomsters appear and wave their big assertions — confidently stated. No matter how many times in the past they’ve been proven wrong. They drown out the reasonable voices, like Hirsh — and the many actual experts. As I’ve said many times, if we get a harsh peak oil arrival (soon, short plateau, rapid decline), their “crying wolf” will bear a large part of the responsibility. Update to this comment: for more about this see If humanity is unprepared for Peak Oil, here are some of the guilty people, 11 May 2010. Seems you’re giving creds what someone else said on your “Rationalizing vs Rationality”, that the main of your posts is to fit polygons into your pre-squared thought processes. IF a THEN b. Because FM says so by the powers vested in his incredible amount of…of what? pre-conceived template of what the world is supposed to function as defined by the pre-conceived template in FM’s mind? Very circular, wouldn’t you say? Before the establishment of the Scientific Method many many lost their lives on such pre-conceived templates. Thanks for keeping your readers fixated on the rearview mirror of our past rather than the harsh decline coming up just ahead. I don’t understand the basis of your objection. Conclusions on this website are based on clearly stated analysis. Some are IMO clear; some are speculative; some are based on values (and hence not provable). For details on this see If humanity is unprepared for Peak Oil, here are some of the guilty people, 11 May 2010. Thank you for drawing my attention to this; I should have provided the reference. The past is still with us, because only by observing our past actions can we learn about flaws in our processes — social processes (eg, science), community processes (ie, a group’s collective observation-orientation-decision-action loop). More broadly, only looking at a group’s past forecasts we see the basis on which to evaluate what they say today. That’s the lesson of the “Boy who cried Wolf” story. I hope you use your rear view mirror when driving! a) all liquid includes a lot of things which are not oil (biofuels for instance) and requires significant quantities of oil or natural gas to be produced. Many of those things have a rather low net energy content, which explain why they are so costly. They can replace oil, but not at the same level of prosperity or social complexity. If you want to measure oil production, you have to look at crude + condensate stats, and those peaked in 2006.
b) production is flattish because of both demand and supply. As we move from cheap, easy oil to more expensive alternatives, the amount of net energy available for the global economy shrinks, which causes economic difficulties, which in turn lowers the consumption (and oil price, which discourages investment). The kind of complex feed-back the Meadows report described in 1972.
c) nuclear worked in countries where it was propped up by covert stat subsidies (the USSR, France and Japan). Two of those states have had major problems. Breeders are an old technology, developed during the fifties, and a significant number of them have been built. They have produced electricity but not enough plutonium to make the effort worth it. Thorium looks promising, but there are reasons why it was not developed : the whole process requires plutonium to be started and plutonium is not exactly abundant, besides, it is not the kind of thing I’d like to see traded on an open market. And of course, our supply of uranium is rather limited. d) geothermal is great if you happen to live in Iceland. In geologically stable areas, however, its potential is fairly limited. Coal to liquid is an old technology, which was used by a number of regimes with little oil and a lot of coal. It proved quite inferior to oil and is highly dependent upon the availability of high quality coal (fortunately I’d say, given the nature of the regimes which usedit). While there is still a lot of coal, the average quality in declining. In Europe we are down to lignite. 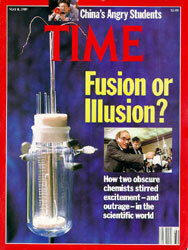 e) fusion is probably our only hope, which is depressing considering how long a shot it is. Achieving hydrogen fusion is easy, but getting an energy surplus is quite another problem, and it is what matters. The first tokamak were built during the fifties and commercially viable fusion energy has been “just around the corner” for my whole life, yet after more than six decades of research, we still have got nothing. Fusion energy looks therefore a bit too much like vaporware to me. f) in fact, most “new energies” touted today are either old (wind, photovoltaic) or untested concepts, which will take decades to develop, in the best case. Frankly, I won’t bet on them. Now I agree that we won’t fall off a cliff. We’ll lose a lot and the bottom will be pretty low, but getting there will take a long time. The descent can be managed, whether it will be managed is quite another matter, of course. Thank you again for your reply! We totally disagree about the most important issue, which is your bleak forecast for deindustrializaton or civilization collapse (however you wish to label it). Below I discuss some details, but leave this key point until the last. I don’t understand that. They’re no more costly than many current petroleum sources — which is why they’re all being produced at the market-clearing price. The exception is corn ethanol, more tax farming than an energy source (but other biofuels are viable sources). More broadly, one cannot examine supply and demand for liquid fuels without including all sources. Many peakists do so, rendering their results into gibberish. Not so (except in the broadest sense). There are no supply constraints after 2008. There is sufficient spare capacity (or shadowy spare capacity, since its so difficult to estimate) to require OPEC production quotas. Even more evident, the signal of supply constraints is rising prices — which “destroy” the demand in excess of supply. We’ve seen the opposite, supply limited in order to boost prices. (4) Yes, nuclear has been a horror show. Rather than showing that it’s not a viable energy source, IMO that shows the complex nature of much 21st century tech, and the need for more thoughtful development processes than “boosterism” (we might learn the same lesson in coming years from genetic engineering). This goes to a point Hirsch often mentions. There is no one “bridge” energy source to carry us through peak oil to the next era. We’ll need to rely on a wide range of sources. All of which have severe limitations. So yes, geothermal has geographic limitations. All currently available alt energy sources have limitations. But in aggregate they can make a large impact. This goes to another factor vital when discussing energy: the time frame. During the next 20 years (perhaps much longer), fusion probably will do little or nothing for us. Over longer time horizons it might have massive effects. This is a common sentiment. It makes no sense, IMO (except emotionally). Technology does not become less likely the longer its under development. How long from the first ballon until blimps and aircraft? That is an imporant fact, significant to more than just energy. Scientific and technical progress may have materially slowed since WWWII. Much of our major science breakthoughs date to 1850-1950 (roughly). Progress appears to have greatly slowed since the 1960s. Considering the challenges ahead, that could be bad news if not reversed. That was the point of my entire post. Although liquid fuel prices might rise quite a bit, there is near-zero basis for your extreme forecasts. Look at the IPCC estimates of fossil fuel consumption during the 21st century. They totally disagree with your prediction, and draw on a wide range of quality research. In other words the oil supply is flattish because of low oil prices. We hit that plateau began in 2005, three years before prices destroyed demand in 2008. In other words we have been on a seven year plateau because of low oil prices. Here are average yearly Brent prices since 2001. Look at the average price before we hit the plateau in 2005, then the average price after we hit the plateau. Now someone tell me, with a straight face, that production has been flat because of low oil prices. Every nation was producing flat out from 2005 thru 2008. Then after the crash OPEC cut back until late last year. Since then every country has been producing flat out again. In June, according to the EIA’s Short Term Energy Outlook non-OPEC liquids were over one million barrels per day lower than they were in December of 2011. And that is with world oil prices over $100 per day as they are today. The reason is because prices, since December of last year, have been so low. Unbelievable! IMO that’s not an analytically useful way to express it. Prices are the factor varying to balance ex ante supply and demand (desired consumption and production). Crudely put, they’re they output of the economic process — not the input. 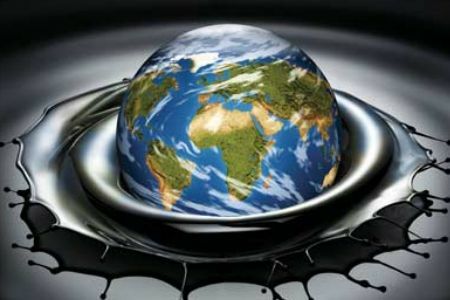 @Ron Patterson – Oil production has been flat because of the growth of alternatives. Something peak oil doomers claimed was impossible. Thanks! That’s a good point, and not adequately discussed in this thread. The development of alternative liquid fuels has mitigated supply tightness (especially in 2008), and will continue to do so in the future. Under some scenarios these will become of vital importance. For example, natural gas to liquids (GTL) and coal to liquids (CTL) could become major sources. Not cheap sources! Readership of Internet articles tends to drop after one or two thousand words. So we have not written the one uber-article that explains all the world’s problems. In fact, it would be a book. Probably a long book. The solution adopted here is to write about these things as chapters in a book, each book an examination of one sliver of our situation. On the right-side menu bar you’ll see the chapter headings. You’ll note that they cover a wide range of topics. Yes, because this is a discussion between two people — not an essay. They’re structurally different things; both have their place. A key point in this post is that it’s false to say “oil goes” away. It’s a canard, one reason the peak oil community has so little influence. I think that we need to differentiate between long term and short term factors that affect crude oil prices. In my opinion, average annual oil prices give us the best indication of fundamental long term supply and demand factors. And of course, Brent is a far better indicator of global prices than WTI. We have seen two annual Brent crude oil price doublings since 2002, from $25 in 2002 to $55 in 2005, and then from $55 in 2005 to $111 in 2011 (with a year over year decline in 2009). In response to the first price doubling, we did of course see a substantial increase across the board in total liquids production (inclusive of biofuels), in total petroleum liquids, in crude + condensate (C+C), and in Global Net Exports (GNE) and in Available Net Exports (ANE). GNE and ANE numbers are calculated in terms of total petroleum liquids. ANE are defined as GNE less China and India’s combined net oil imports. I would particularly note the divergence between the first chart, Total Liquids, and the last chart, Available Net Exports (ANE). I estimate that there are about 157 net oil importing countries in the world. If we extrapolate the Chindia region’s rate of increase in their combined net oil imports, as a percentage of GNE, in 18 years from now, around 2030, just two of these oil importing countries–China & India–would consume 100% of GNE. US annual crude oil production rose from the pre-hurricane level of 5.4 mbpd in 2004 to 5.7 mbpd in 2011, versus the 1970 peak rate of 9.6 mbpd. This is helpful, but the former CEO of Shell Oil described it as a “trickle” of higher production, and we remain dependent on imports for about 2 out of every 3 barrels of crude oil that are processed in US refineries. We do have of course have production from thermally mature shale formations, like the Bakken and Eagle Ford, but there has been no commercial production from the “shale” deposits in Colorado (the Green River Formation), which are really a kerogen rich marl deposits that have to be “cooked” in order to produce a liquid that can be refined. In any case, I suspect that the net energy to be derived from these kerogen deposits is, at best, minimal. And of course, Canada has shown increasing net oil exports, which are calculated in terms of total petroleum liquids, but the combined net oil exports from the seven major net oil exporters* in the Americas and the Caribbean fell from 6.1 mbpd in 2004 to 5.0 mbpd in 2011, an 18% decline in six years. The dominant trend we are seeing is that the US, and most other developed oil importing OECD countries, are so far at least gradually being priced out of the global market for exported oil, as annual global (Brent) crude oil prices doubled from 2005 to 2011. For more info, you can search for: Peak Oil Versus Peak Exports. I don’t understand what you’re attempting to say. Or how you disaggregate the many factors affecting energy supply and demand. Esp effects on demand of rising prices. I have no idea what you are attempting to say. “Priced out” usualy means unable to buy desired quantity of the good at a price willing to pay. Which is clearly not so in recent years and today. First, the supply side: Annual Brent prices doubled from 2002 to 2005. So, we had a strong price signal. And we saw a strong positive supply response. Annual Brent priced doubled from 2005 to 2011 (with one year over year decline in 2009). In response, crude oil production was flat. We saw small increases in total petroleum liquids and total liquids (inclusive of low net energy biofuels), and we saw a material decline in Global Net Exports of oil and in Available Net Exports, with the volume of oil that is available to importers other than China and India falling from 40 mbpd in 2005 to 35 mbpd in 2011. 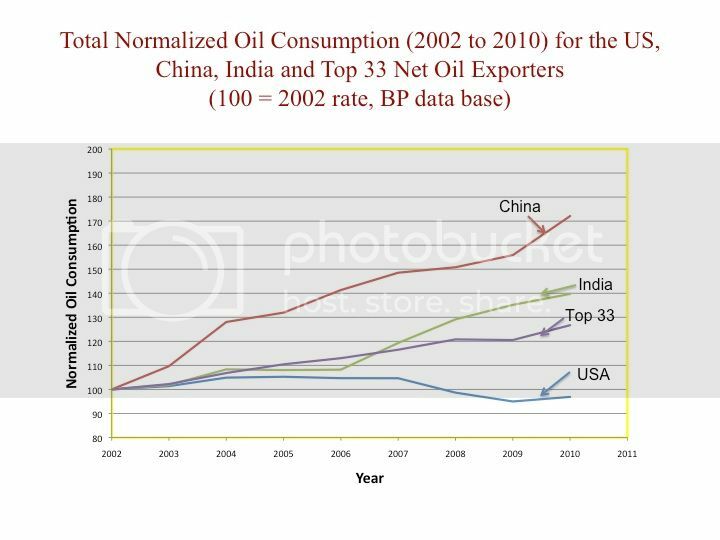 And on the demand side: Here is a chart showing normalized oil consumption from 2002 to 2010 (BP data) for China, India, top 33 net oil exporters and for the US. 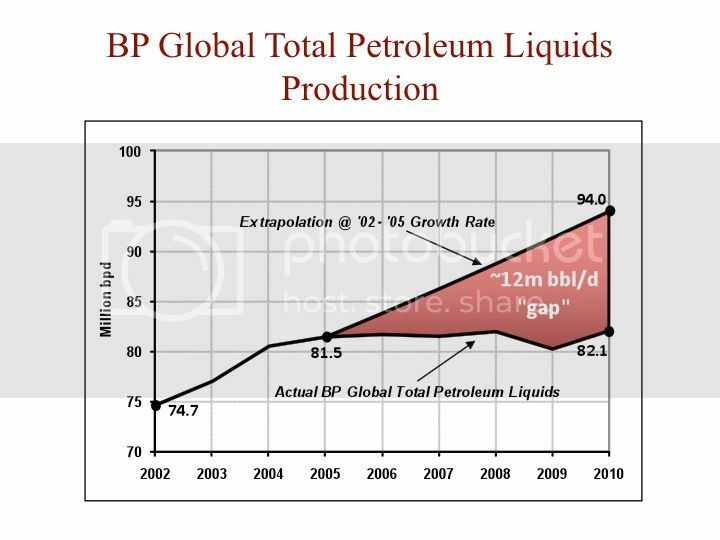 The chart is not yet updated for 2011, but the trend on the chart continued in 2011, to-wit, China, India and the oil exporting countries showed increasing oil consumption as Brent priced doubled from $55 in 2005 to $111 in 2011, while consumption in the US (and in most other oil importing OECD countries) fell. Many factors drive oil consumption. Most especially economic activity. Europe and the US fell into a long recession in 2007, while the emerging nations continued to grow. The recession was driven by many factors. In the US by excessive private sector debt and a weak banking system. In Europe by effects of the flawed monetary union. Plus of course the effect of increase efficiency and reduced demand from the post-2002 price increases. 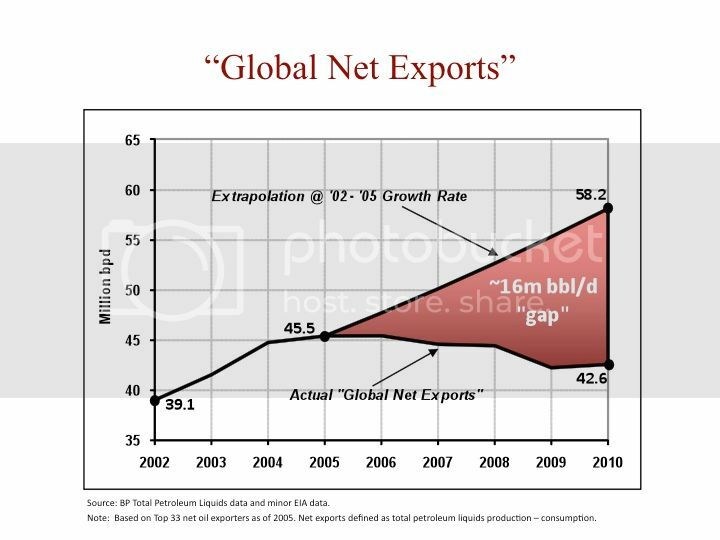 My principal point is that I’m guessing that perhaps 0.1% of the people in the world have some grasp of what is going on regarding global net exports of oil. ANE (Available Net Exports) are defined as GNE (Global Net Exports) less Chindia’s combined net oil imports. 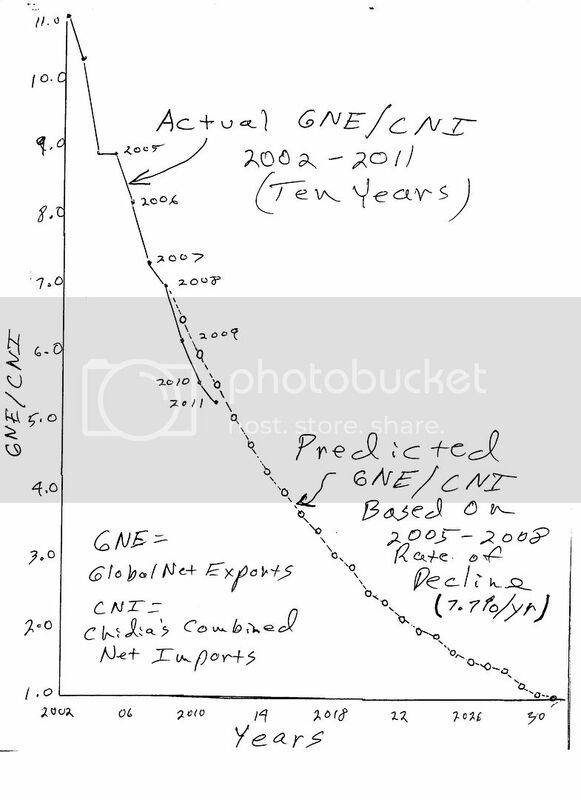 The following graph shows the ratio of GNE to Chindia’s Net Imports (CNI). At a 1.0 GNE/CNI ratio, the Chindia region would consume 100% of Global Net Exports of oil. The 2008 to 2011 decline in the GNE/CNI ratio (8.7%/year) was faster than what the 2005 to 2008 rate of decline (7.7%/year) predicted we would see. 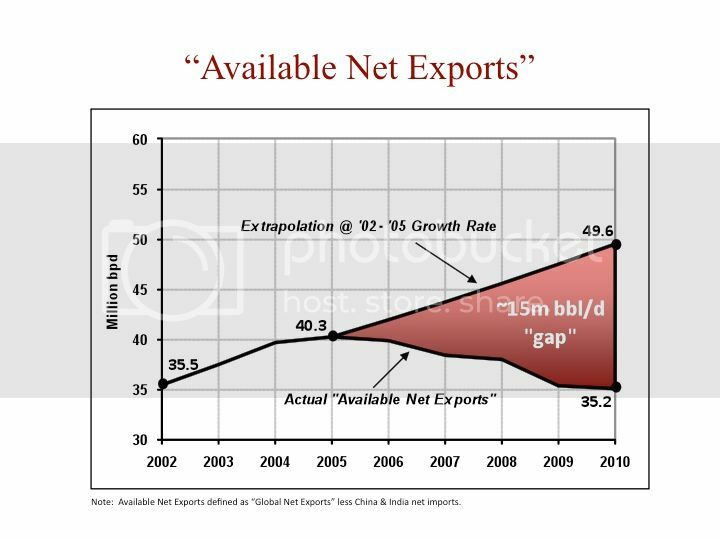 Based on the six year (2005 to 2011) rate of decline in the GNE/CNI ratio, estimated post-2005 Available CNE (Cumulative Net Exports) are about 168 Gb (billion barrels). Cumulative ANE for 2006 to 2011 inclusive were about 81 Gb, putting estimated post-2005 Available CNE about 48% depleted at the end of 2011. The 2005 to 2011 rate of decline in the GNE/CNI ratio, if extrapolated, suggests that China and India would be consuming 100% of Global Net Exports of oil in the year 2030, which is 18 years from now. Of course, I don’t think that will actually happen, but that is the trend line, and the rate of decline in the GNE/CNI ratio accelerated from 2008 to 2011, versus 2005 to 2008. I remain uncertain what you are attempting to say. The magic of straight-line forecasts! As a young man I turned in one such. The company’s President said “Son, there are no straight lines in nature”. In fact China’s growth has already slowed to almost half of its peak (7.4%, if their reports are accurate). That will continue to slow. Not only due to natural maturation, as China rises to the top of the “S” curve, but also because China will age unusually rapidly due to its one-child policy. We are clearly seeing evidence of some weakness in global demand, with Brent currently around $100, versus $111 in 2005. But that’s the point. Demand has had to accommodate a declining supply of GNE, with the Global Net Exports being rationed by price, with the developing countries, led by China, so far outbidding the developed countries for access to a declining supply of Global Net Exports of oil. But the $64 trillion dollar question is what happens going forward. It seems to me that most analysts are looking at a slowing in the rate of increase in Chinese demand for energy. However, one point to keep in mind is that the EIA is showing Chinese oil production as being flat year over year. I guess I remain uncertain as to why all of this is not clear to you. It’s not clear to me because you don’t state your theory, but instead give a long list of facts. Yes, everybody familar with energy see the same facts. What are you saying is going to happen? Over what time scale. If you stated it before, just quote it. All I see is you say a somewhat absurd linear extapolation of demand from the emerging nations. Small correction: We are clearly seeing evidence of some weakness in global demand, with Brent currently around $100, versus $111 in 2011. You cannot infer changes in demand by looking only at the price. Short-term prices (such as YoY) vary due to changes in supply, demand, and inventories — which in turn are affected by many factors, with complex inter-relationships. @Jeffrey J. Brown – The US now imports less than half of it’s oil consumption. You would think a person like you who spends 24/7 studying the data would know this. The next time you throw out numbers, make sure and include natural gas liquids and biofuel, because yes, they do count. I hope I have not contaminated you by example! Let’s try to play nice on this thread. Evergy is a complex subject, and all of us non-experts can easily reach the boundaries of our knowledge. Sometimes without knowing it. I’ve read your blog on/off for a while. While some posts elucidate, most are Rationalizing rather than Rationality. I’ve wondered what could make someone so rational sometimes but something other most other times. I’ve come think it has to do with the subtitle of your blog: “A discussion about geopolitics…from an American’s perspective…” This, along with your esteem of Fabius Maximus who lived on the sweet spot of the Roman Republic, makes your perspective very narrow and specialized. Specialization was good in the sweet spot of American “exceptionalism,” a time when energy was so abundant everyone forgot the central role it plays in all human endeavours and started believing their egos alone powered all accomplishments. That is no longer the case and specialization’s become a hobby of constant diminishing returns. To get even-keeled again, and get a proper perspective on our future, you should read Dr Charles A S Hall, author of “Energy and the Wealth of Nations: Understanding the Biophysical Economy.” It is an expensive textbook so a quick intro to his research would be to listen to From Alpha to Omega podcast 1st episode where Dr Hall is interviewed on his research. You’ll really get a grounding on the vital role energy plays in all we’ve created and all that’s happening. You’ll then understand how all human endeavours are a subset of available enery in the system; and all the implications that understanding portends as we accelerate into an energy-scarce future. You’ll be a realist, a stoic, and may even find Seneca, Marcus Aurelius and Cato the Younger much more relevant figures Americans should look to emulate. Good luck. (1) What are you attempting to say? I don’t see any message in your comment, other than a bit of patronizing disagreement. Considering the wealth of authoratitve sources I cite, such easy dismissal is difficult to take seriously. I am familiar with the concept of EROI, and you great exaggerate its likely impact over any time frame. You put it in quotes. Who says such a silly thing? The only hit to it on Google is an astrology website. I’m skeptical of mono-causal explanations for very complex historical occurrences like the Fall of Rome, attributing Rome’s decline to some sort of energy use imbalance nonsense instead of to a miasma of cultural, political, and economic factors. How could Rome’s fall be because of “energy” problems when we see a very advanced energy civilization existing today in the very same geographic space? The real question is: what combination of factors led to Rome’s failure to improve its technology. Why wasn’t Hero’s invention of the steam engine exploited by that culture? That’s a political-cultural question, not an energy question? As to FM’s use of Fabius, I’ve always understood the historical FM to be a great example of personal and non ego driven, non self promoting service to the Republic. He pursued a correct and patient strategy during the Punic War in the face of popular criticism, sometimes intervening to save the more flamboyant younger generals from their own mistakes without humiliating them in the eyes of their countrymen. One of the great examples of moral public service in all of history. (1) Maximus, excuse me for coming off as patronizing, it couldn’t be helped when pointing out your Rationalizing vs Rationality. One of the best things I like of your posts is the wealth of references you post (not the constant self-referencing to previous own posts though), of course it takes a while to go through them and even more to find differing views in order to apply some critical thinking (reason why personally I don’t do it frequently unless real interest in subject discussed). Case in point, you mention nuclear as a given in its potential and self-referencing as you mention its “incompetent application so far.” While any in-depth reading into nuclear makes it obvious the energy sink that it is when taking into account just the vast amount of concrete each reactor requires, concrete made not with nuclear or fusion but with petroleum derived diesel. Take into account any additional factor and is clear if it weren’t for its secondary use as fissional material cauldrons, govts would’ve given it up same way they’ve given up Moon Landings. Fusion? Outside of the fusion reactor about 150mK away from us (ie THE SUN), any investment into fusion is nice for basic knowledge, don’t ever think this offshoot of hominids will ever downsize it to nuclear plant proportions. (2) EROEI defines why our infrastructure keeps crumbling no matter how much taxes are increased on its users. Most of it was built when USofA was net producer, when -at times- petrol was cheaper than potable water. Read Joseph Tainter a bit to understand how a complex society as ours gets to the point where more energy is required simply to maintain the infrastructure it’s come to depend on. Not grow, not replace, only maintain the infrastructure requires more energy than it took to build it. Seen EROEI define the utility of a finite resource, it is disingenuous to believe it doesn’t apply “over any time frame.” At particular moments of peak resource, such as we are in the midst of, is when it applies the most. Unna, pay attention to that previous part, that’s what pressured Rome to simplify; getting to the point that all their sorrounding vassal states were needed just for maintenance of the core. All the losses they had up to the onset of the Dark Ages was them trying to maintain the status quo at whatever cost, something we seem to bent to repeat. (3) “reignite the spirit” is part of your blog’s subtitled Maximus. Annus, re the historical FM I give you all that and I don’t ever want to take away from the person he was but the times he lived were very different to the times Seneca, Marcus Aurelius and Cato the Younger lived. Those three were very much the same as FM but even more so for the lived in the decline of Empire and still chose to face the future stoically, attempting to simplify while remaining civilized and humanized. As regards tech, again, like much of human dreams, tech is a wholly-owned subsidiary of Available Energy In The System. Little energy = Even Less Tech, same as Little Energy = Even Less Human Dreams Becoming Real. Please research Biophysical Economics, or Land Economics, or just read the papers by Dr Charles A S Hall, a quick googling will give you a wealth of data to keep you busy for weeks. Basically we’re scraping the bottom of the barrel fellows. As John Michael Greer says, “choose to collapse now and avoid the rush.” Choose to adapt to living comfortably with the least you can now while the system still gives us things for free, than waiting for later when everyone is forced to forcibly live with less; it’d be a mad rush then. I hate to admit this, but I’d forgotten that it’s on the masthead. Thanks for the reminder. Still, comparing “reigniting spirit” to EROI is a category error (ie, comparing volume of a dog’s bark to apples). Can you provide any supporting evidence for that statement? There are thousands of pages of analysis by experts about the world’s physical infrastructure. How much of it is “crumbling”? Who attributes it to falling EROI. In fact my guess is that most of the world’s infrastructure is increasing in quality and quantity. The US has its own problems, with tax-cutting madness sweeping the nation since California voters passed Proposition 13 in 1978 — followed by the massive Reagan cuts. Worse, public spending has been shifted from domestic infrastructure to military, social benefits, employment coss, etc. I’ve seen a lot of expert research about nukes, and seen nothing remotely like that conclusions. For example, do you have a reliable source comparing the energy generated by nukes to the energy cost of the concrete used to build it? (3) Most of this is just made-up-stuff. Typical doomster fantasies. If you cite some reliable sources I’ll discuss it. EROI is falling, which is (loosely speaking) why prices are falling rising. This is common in transitonal errors (trees/peat to coal, whale oil to oil, etc). If we don’t find alternatives during the 21st century there will be serious problems. Given the time, it’s not the top of my list of worries. But the transition to peak oil is a different problem. While not civilization collapseing, a long deep recession would be unpleasant — and can be avoided if we act soon. Confusing the two phenomena leads to both being ignored, which could have ill consequences. Thanks for drawing my attention to it. I missed it admist the many comments. I see our problem(s) largely being one of culture, politics, corporate media, and Wall Street. No instition run by man will ever be perfect, however as these things now stand it is hard to determine TRUTH. Most of us have been quite content to burn through about 1/5 of world oil production with about 1/20 of the worlds population. Military power, and the US dollar as the worlds instrument of trade have helped make this possible. The fall of the US dollar and replacement with another currency (for comodities) would make our present problems tame by comparison. We have become a “short term” culture, with little thought for future generations. Big corporations usually act in their own best interest, and that of the stockholders. They have evolved to the point where they hold no aliegence or concern for any nation (other than what is in their own best interest). It is just their nature. Shell, Exon, BP ect, the media, our government will tell us little about peak oil. Even if it is true, we just don’t want to hear it. If peak oil is real, and their is no replacementent, we may head for a pre industrial world population of about 1 billion. So the outcome could be devastating, brutal. This issue (along with climate change) merit mature, careful thought, and debate, long absent in our culture. IMO most of that is incorrect. The transition might be painful, especially if managed poorly. But broadly speaking that’s probably incorrect. Economists call reserve current status a poisoned chalice for good reason. It’s fun but has long-term deleterious consequences. Which is why nobody is easger for their currency to replace the US Dollar as the reserve. For example, China has worked hard to delay their treaty obligations to make the RMB fully convertible. It’s fascinating how people repeat this nonsense no matter how many authoratative sources show that it is not true. Even good liberals, who worship the IPCC, ignore the IPCC’s forecasts about fossil fuel consumption. Since we already know of alternative sources that will carrry us through the 21st century (although not easily or cheaply), this doomsterism is unwarranted. And the assumption that tech progress has stopped is too silly to discuss. Fabius, as per military power and access to oil; if not then why the aircraft carrier battle groups in the North Arabian Sea, and/or Persian Gulf from at least 1980 to present? If the Middle East had no oil would we be there? One could strech the scope of that question much further. Nations throughout history have used there military to control access to resources. How about Libia, if they had no oil would we have used airpower to influence the outcome? What makes us so different, am I missing your point? Or did I fail to make my point? I would agree that there are dangers in a reserve currency, and if the dollar does fall and is replaced, there will be plenty of pain to go around. I hope we have a good plan to manage that possibility. Our record on the economy inspires little confidence. Peak oil! My feeling is we may have time, but you have more faith in the present political and corporate system than I do. What do you see as a substitute, and at what cost to an infrastructure build over the past hundred plus years. I would agree that peak oil may be in the distant future, but that assumption is based on present production increasing to meet future possible demand. What are worldwide oil reserves, for example what are Saudi reserves at present production rates? Unless you know something I don’t, they hold that information close and allow no outside verification. If one believes that China, and India combined have about 8 times our population, and want to consume as we do (if they don’t self distruct), then could the world produce 180 million plus barrels of oil per day? If that comes to pass I think we will shortly have an answer on peak oil theory, and man made climate change, one way or the other. Lots of good questions here! They are there to maintain control, so that others do not have the ability to close the flow to the West. Those nations are pumping and selling oil to us because of the US fleet. They’re selling the oil to the West because they need the money. Agreed, since the late 1960s. But our longer-term history is great. Esp from 1940-1968, or 1783 to now. We can gain confidence from our history. Yes, exactly. Our system is a powerful economic machine. Such things as social justice and environmental care are externalities, which is why we have a Republic. Our weakness lies in planning — for things like peak oil. This post has links to others discussing that in some detail. IMO that’s an unreasonable question. I cannot see that far into the future, and doubt anyone can. Every new decade starts with predictions, most of which usually prove wrong. (a) I mentioned that in this post, regarding the difficulty of reliability estimating peak oil. (b) A lot of smart people have worked this problem. For the Saudi’s we have pre-nationaliation data (before 1980) about the geology and reserves — plus the considerable fragments that have been released in articles since then (see Matthew Simmons’ Twilight in the Desert for description). Most estimates run from 2 Gb (BP) to 3 Gb (USGS). Plus the far larger — and more expensive to tap — unconventional hydrocarbon sources. That’s a lot of whale oil! But then we don’t use whale oil anymore. And when we get to that point in 50 – 75 years, my guess is that we’ll not be using much oil. Rising prices, if nothing else, will force that development. “We have the technology.” Or at least the kernals of the necessary technology. It’s not certain; few things in life are certain. It’s another on a long list of things to worry about, a list that’s remained long since we quit being savannah plains apes. These are to some extent inverse problems. If the IPCC is right about emissions, then peak oil is not a problem. I want to make two points: One is what peak oil people actually say and this is in response to “A key point in this post is that it’s false to say “oil goes” away. It’s a canard, one reason the peak oil community has so little influence”. The second point is a response to your statement that prices reflect demand more than supply conditions: “consumption is flattish because of demand, not supply. Otherwise prices would be rising to destroy the excess of demand over supply (as it did in Spring 2008)”. Peak oil is not about oil going away, it is about production volumes – the tar sands in canada are enormous but production flows are highly constrained (and it is very expensive) – so peak oil is about rising production, then peak production followed by plateau/decline. For any finite resource, this is expected and has been seen for individual fields and regions (Texas, North Sea etc.). Yes, one reason for ‘so little influence’ is that the peak oil position is commonly mis-represented (oil isgoing away, we are running out…), like ‘death panels’. Now the question, which is difficult to answer definitively, is with respect to global peak production – argument of peak oilists are that we are on a plateau despite strong price signals for more supply. Now it is true that production rises have indeed slowed and so the question is why – your statement tells the reader that it is demand side such that, I assume, if demand increases, production will come online in response. So let us examine that. 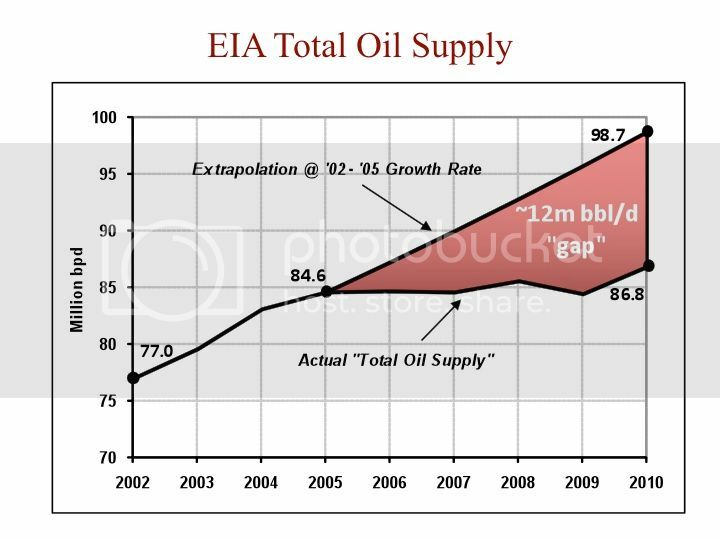 Many years ago I started looking at oil supply and prices and by 2004 came to the conclusion that geological factors could see a run up in price. In 2004 CERA/EIA spoke of oil prices falling to $30/barrel or less. Well Southwest must have known something – they hedged at $50/barrel. Now, I pointed out at my business school that I saw a possibility of $80 oil and temporary ‘superspikes’ of prices in the range of $100-110 per barrel. I was ridiculed at the time. Well this happened and if I told the MBA class in 2004 that in 2012 Brent crude would be approximately and persistently around $100-110/barrel (the ‘superspike price’) during WEAK global economic conditions, I would have been laughed out the door. Price signals are an important indicator of supply and demand conditions and running averages are a better than spot prices at given times – average prices today are significantly higher then historical world prices even adjusted for inflation and in weak economic conditions. While I do understand the points you make about economic conditions suppressing demand, it is precisely that – weak economic conditions and record average oil prices – that suggests something is happening on the supply side – otherwise, there should be a price collapse closer to historical world prices ($25-35/barrel in 2012 dollars). I do appreciate you getting in on the debate and much welcomed and hope my thoughts help in this debate. That is not a “misrepresentation”, but a commonly expresed view in the peak oil community. It’s seen in many of the presentations at the ASPO conventions, which describe dire economic scenarios based on immediate crashes in oil production — which many big names in PO circles have been predicting repeated and falsely for decades. There are more reliable voices, such as Hirsch, but they tend to get drowned out by the outlandish doomsters. And the community leaders do nothing to correct this long-standing problem. That displays a deep misunderstanding of petro-economics. Prices are set by the cost of marginal sources. As we tap lower grade (in a broad sense) sources, the marginal price rises over time — offset by improved technology (reducing cost to find, extract, and refine). Ore quality and qunatity are ineversely related. As exploit lower grade deposits, the quantity avilable increases — as does the price (offset by new tech). It’s also incorrect, on a basic level. Yes, the peak oil community has had lively debate on the rate of decline in oil production on the downside of the slope and some call for very steep and some for a more moderate decline – the debates have been for the most part and in my view excellent – new tech such as multilateral will have steeper declines and tight oil and deep water have evidence of sharper declines then conventional – so this debate (usually with extensive evidence and data) is important and is about production volume – oil will flow for centuries, but expected to be at declining rates and it is the rate that is indeed debated (in addition to timing of peak) – so no, the oil is not ‘running out’ or ‘going away’ – this is what many people I know happen to think what peak oil is about; now if originally you meant production volumes regarding specifically doomster predicitions of crash in production rates, then I mis-interpreted you andf yes, this can perhaps undermine credibility. But in all debates, there are extreme positions and it is to be expected. But rapid decline rates is different from framing peak oil debates as oil ‘going away’, implying it runs out and suddenly there is no oil. I have been following ASPO and TheOilDrum and the destinction between the two framings has been made numerous times in the debates I have read. On the point of doomsters, while Hirsch is not a doomster, his reports are still quite sobering regarding the realities of transition and mitigation. You are correct that we cannot return to historical world prices – I realised this just after posting but it actually emphasises my point that something is happening on the supply side. Marginal cost of supply is rising due to inability of conventional sources to meet demand and so must be met with more expensive unconventional – this is actually part of the peak oil story – peaking conventional oil. But this seems then a supply side story… yes? So it is a classic story – the current equilibrium price is based on the market demand under weak economic conditions and the marginal cost of additional production – that the average price is $100 and up is evidence to me of peak oil scenarios – cheaper (conventional) sources are fully exploited – conventional supply has been fairly flat for some time and if it were expected to grow in future significantly, then expensive new sources would not be developed – so demand is increasingly being met by more expensive and difficult to exploit plays – cheap oil is over. Note that these new sources will come on-line but they have to make up for decline rates of the existing production base and this will be more and more difficult over time. Oil will not be getting cheaper. So I reiterate, yes, something is certainly happening on the supply side, otherwise, prices would be back to historical prices – but they are not, and as you point out correctly, they cannot. So from a broader interpretation of what the peak oil debate is about, in my opinion, we are experiencing the effects of peak oil today. You don’t appear to be reading my responses, so I doubt there is any point in trying again. But I’ll reply briefly to a few points you make. What you consider as the evidence of “peak oil” is a process that has been in motion for 40 years. Demand increases, forcing us to expoit lower-grade (broadly defined) deposits. That is a supply-side phenomena, but since its been going on for decades it’s hardly signs that peak oil is nearing. It occurs in fits and starts, as the many many factors interrelate. Capex rises and falls. New discoveries, new technology. Global GDP goes faster and slower. So demand spurts, stagnates, sometimes even drops for years. This process might continue for years or even decades until global peak production. Is that intended as a rebuttal? I’ve said that scores of times. Several times in this post and thread. Cheap oil was over at the modern historical price low (from memory, using WTI) in 1998. that was 14 years ago. But we have adjusted to current prices. When they rise again, the global economy will adjust to those. Economic shocks are in general from rates of change, not levels. But why is demand falling? Because people realize that we are running out so they conserve or because an increasing amount of people are becoming/remaining impoverished? The latter is not good and will need to be dealt with some how. This may be the biggest reason for the occupy movement. Plus what happens when the time comes when oil fields around the world begin hitting their peak and those countries inevitably make the decision to nationalize all oil fields to be utilized for their own people? This too is a bit frightening and could very well lead to a cliff of a decent, among some very nasty wars! As expalined in this post, liquid fuel consumption is not falling. It’s up roughly 2% from the pre-recession peak. Neither. We’re not “running out”; few of the world’s people believe that. On a net basis, the world’s people are becoming better off — and that’s continued even during the past few years. What economists generally call a “recession” for the world is real GDP growth of less than 2% per year. In the US many people are worse off, but only a small fraction have become “impoverished” (that’s sad for them, of course; unnecessary too). More in Europe, due the severity of the PIIGS’ downturn. Most of the world’s oil reserves are in a small number of nations. Hence they will continue to export what is their primary national resources. Most of them have already nationalized their oil, to varying degrees. You are allowing yourself to be frightened by a hypothetical situation that might 9or not) occur sometime during the next two decades. I suggest that there are many more serious threats. I wonder if resource depletion will lead to a negative correlation between EROEI and the ratio of energy expenditure to GDP? I think it might be possible that future reliance on ever-lower returns might significantly increase the portion of our society devoted to extracting and distributing energy. The increased necessary investment might preclude a profitable business venture, and so this might only happen if government subsidies to energy infrstructure were to increase as a portion of GDP, which is entirely possible. Also, I think Fabius places too much hope for the prosperous future of humanity on the shoulders of Bussard’s polywell. It is indeed the most promising alternative energy prospect I’ve seen, but may never actually become the panacea we need. Technological developments in general are sporadic, especially in the modern age, and I don’t think it’s wise to count our chickens before they hatch. (1) I’ve lost interest in the fantasies about EROI that are starting to dominating this thread. This is a data-driven website, unlike the usual websites where people just chat about issues. Please cite sources (not peak oil guys, real experts) for any additional comments about EROI. Energy is one of the most intensely studied topics in recent times. If you cannot find actual expert analsyis remotely supporting your conclusions, I suggest that you assume that you are wrong. I said nothing even remotely like that. Pease read more carefully. Also, I suggest replying to quotes. I do that, as I found it avoids these kind of errors. (1) I’m not making an unsubstantiated claim about EROI (and hence didn’t feel the need to cite something), just proposing a hypothesis about how it might affect our economy. If you would deign to consider it, I would love to hear your comments. (2) You’ve never said as much directly, but I’ve inferred it by reading your various articles on the topic (especially this one: Eventually we’ll have unlimited cheap clean energy. But that will not help us or our kids). However, please forgive me if I’ve misread between your lines. I was reacting more to the other mentions of EROI. You question was apropos, and I should not have put the comment in reply to yours. There is no brief answer to your question. Investments in anything are not a dead weight on the economy. They generate jobs and profits. Reading the EROI doomsters one might think that new oil extraction and refiing equipment come from slave labor extorted from us all. It’s the best known of the next-generation fusion programs, and so I cite is as an example. However as in this post I try to always describe it as an example — AND clearly state that these are early stage projects. They might have great results. Or no results. Note the post you cite. It says “various fusion programs, such as the polywell and the International Thermonuclear Experimental Reactor (ITER), are all at the laboratory stage”. Have now been reading more of your responses to various readers and now prefer that I never participated in the debate around your article. I am new to this forum and came across it during some research and thought worth the read and even making some comments. But the tone of your responses is appalling. Regardless of what you think of the merits of reader comments, it is uncalled for. Thanks for the feedback. I will keep that in mind in the future. And thank you for your participation. Stewart, it’s very easy to lose one’s self in the peanut gallery, even for one as smart as Mr Maximus. Sad but true. That’s the same reason that fights start in bars. As a followup to Guthrie’s generous comment, here’s an explanation (FWIW). My personal preference is not to have comments, like many of the website run by people who are good at this (the Instapundit, James Fallows, the folks at Lawfare, many scientists’ blogs (eg, Roger Pielke Sr). But many readers requested them, so here they are — warts and all. Second best is to moderate lightly but seldom reply. Like Watts Up With That and CLimate Audit. Not my style, unfortuantely. Emotionally satisfying but too much work, and IMO not fair to commenters is to reply seldom but moderate heavily (including deletions of disagreements), as done by economist Brad Delong, climate blogs of Joe Romm, and at RealClimate. Another option is to not moderate and seldom reply, but sometimes make brutally harsh comments. Like Glenn Greenwald at Salon. I shiver when reading some of his replies. Like mine but by a far sharper, colder, and more articulate mind. I’d like to do better, but running this website already strains my resources to the limit. Replies get entered in odd moments between job tasks, under great time pressure. I focus on replying as much as possible with analysis, information, and links. Obviously other desireable qualities don’t make it, like mature reflection. Those are my priorities. Although it doesn’t show in this thread, I’m trying to do better. Each and all of my co-authors could do this much better. Smarter replies, more balanced, with wit. But they won’t do it, so the second team attempts to fill the gap. They are busy people with full lives. Answering comments is way down on their priority list. EROEI is doomer nonsense. What matters is the FINANCIAL VALUE of the finished product. Can you please explain that further? EROI IMO ssems like a useful concept. To use a bad analogy (I’m a master at bad analogies) final value is like gross sales — EROI like the profit margin, energy-wise. @Fabius Maximus – Let’s take Ethanol as an example. Sure it requires a lot of energy input from natural gas to produce. But as long as natural gas is cheap, and liquid fuels that can power existing vehicles are expensive, it makes sense. Same goes for tar sand production. Energy inputs and outputs are completely irrelevant. EROEI is nothing more than a doomer strawman. Let me repeat this back to see if I understand. You mean if it can be produced at a profit (including capital and operating costs) sufficient for someone to do it (ie, acceptable risk-adjusted return) — then it’s a net benefit to society. The inputs are relevant to the guy doing it, but not to the wider society. That’s my view as well. EROI is useful as an analytical tool, but essentially confirms the signal provided by rising prices. This is profitable to the producer, but only because of the government tax code. Hence the common note it is tax farming. Here EROI helps the analysis. It has a near-zero EROI, so there probably is a non-commercial factor at work. Public funding, in effect. The EROEI strawman goes something like this – once it takes a barrel of oil to produce a barrel of oil, game over. The entire 10+ trillion barrels of unconvnetional oil will make no difference. It’s a strawman simply because you do not use oil to produce ethanol, tar sands, heavy oil, etc. In fact, some of the ethanol in Brazil is being distilled with energy from biomass. How about we add in the solar energy it took to grow the plants for biofuel AND fossil fuels. Then the energy balance is ALL negative. So what? Also, the Republican Congress removed tax credits for ethanol blending last year, yet the market is still growing. I had not heard about the loss of corn tax credits. Thanks for the tip; I’ll check on that! (1) It’s not a Republican Congress. The Democrats have a majority in the Senate. (2) Congress did not remove the tax credits, they expired: “After Three Decades, Tax Credit for Ethanol Expires“, New York Times, 2 January 2012. (3) One source I use for this subject is Seeking Alpha; it says that the other subsidies have compensated for the lost subsidies. I know nothing about this (ie, I eat corn, but that’s it). FYI, FWIW. I would suggest that the current growth in the US ethanol industry is being driven by the high price of Brent, and exports to Europe. This situation illustrates one of the major arguments against peak oil collapse theories. If oil supply/demand becomes tight, the price rises. Higher oil prices open the door to alternatives. Agreed on all points. This is one of the most powerful yet underestimated forces of economics: the ability of prices to shape the world. it’s not magic — alternatives do not arise from the soil like skeleton soldiers from the hydra’s teeth. There are limits. Rather it’s that the limits are usually far broader than expected. Of course we know oil production didn’t peak 17 years ago, but more importantly, Hubbert’s estimate of 2 trillion URR is way too low. Hubbert did not include unconventional oil, shale, tar sands, heavy oil, deep water, etc, in his estimates, because there was no technology to produce these resources in 1974. We have the technology now, and new technology is constantly being developed. This is why recovery rates are always increasing. Some experts estimate as much as 16 trillion barrels URR. It is more likely that future emissions regulations will curtail oil production long before we “run out”. Now you’re being harsh to Mr. Hubbert. You’re making me look like a gentle guy! Let’s take this by the numbers. (1) I don’t understand. How is Hubbert’s prediction a “theory”? How are you “refuting” it? It was a prediction, made 38 years ago with very little data. 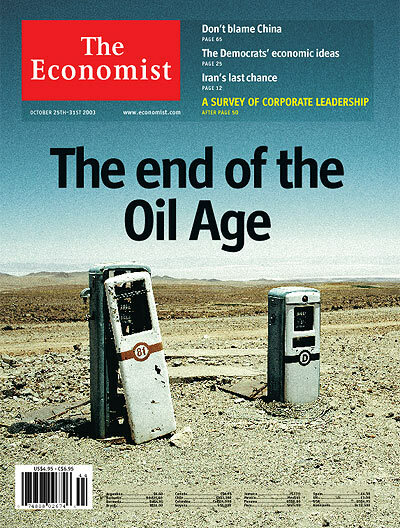 He was wrong, but almost all long-term predictions about oil turn out to be wrong. BP’s current estimate of URR is 2Gb (from memory). Hubbert then, like BP today, is talking about oil. Yes. This goes to what is IMO the great mystery of oil. The inverse relationship between ore quality and quantity was standard textbook knowledge in the 1970s. It’s lost knowledge today. But — each extra decrement of quality increases cost (net of increased tech) of extraction and refining. Which is why at some point we get to peak oil. Hubbert’s peak oil theory is a theory: Wikipedia. It has been proven wrong because we did not peak in 1995, and 2 trillion URR is not accepted by most petroleum geologists at this time. BP’s current estimate of “proven reserves” is 1.6 trillion barrels, or approximately 50 years of oil production. This figure DOES NOT include the 1 trillion barrels that we have already used up so far. Based on this estimate, Hubbert was off by 600 billion barrels so far. However, “proven reserves” are not URR. This is where peak oil doomers can trick people. Proven reserves have historically “grown” over time with increases in price and technology. Also, some organizations require that the resource is actually producing before it can be considered as proven reserves. E.g. Venezuela’s reserves were upgraded by some 500 billion barrels by the USGS after production began. 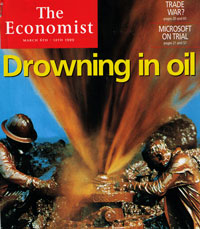 Even though the oil resource was known for some time. It’s also interesting to note that proven reserves in 1948 were 20 years, 35 years in 1972, 40 years in 2003, and 50 years in 2011. This shows how reserve numbers grow. If proven reserves were “all that there is”, we should have run out of oil back in 1968. You’ve made a good case about Hubbert. There is a large body of expert literature about Hubbert’s Peak. Can you point us to some articles explaining that Hubbert’s theory is disproven? It’s out of my area of interest. For anyone interested in definitions of different kinds of oil reserves see this page by BP. Edit: Venezuela’s reserves were upgraded by some 500 billion barrels by the USGS after HEAVY OIL production began. Hubbert stated that world oil production would peak in 1995. EIA data shows a new peak for crude + condensate in 2011. Their data is in .xls format, but I found a nice graph on one of the doomer blogs: Energy Bulliten. For energy stats I recommend using the EIA and IEA websites. I usually use the EIA website for liquid fuels data, which they provide as spreadsheets. Per request for a reader, we’ve changed the display of comments. The last comment is first, they’re displayed newest first. An excellent article, FM, and I applaude your patience in answering some of the comments here. The article covers a vital topic that has been buried in propaganda and overly self-confident prophetic statements. I am sure that there is a silent majority of your readers who are glad for your sources and the clarity of your writing. Hmm, isn’t that a bit like saying that the boy who cried wolf is responsible for an actual wolf showing up?! Even if the boy was just trying to get attention by making up a story about wolves, I still fail to see how that would be the proximate cause of a pack of real wolves suddenly appearing and attacking the flock… I just can’t quite seem to wrap my mind around that kind of logic! I understand your point, and both of these perspectives are valid (who can judge such things?). Think of the peak oil community not as a little boy — who bears no responsibility, and is a child to boot — but as a town’s night watchman. Repeated false warnings are false positives, degrading his utility and weakening the defenses of the community. All these are just metaphors, since there is no one true perspective. Americans constitute 5% of the world’s population but consume 24% of the world’s energy. On average, one American consumes as much energy as 2 Japanese, 6 Mexicans, 13 Chinese, 31 Indians, 128 Bangladeshis, 307 Tanzanians, 370 Ethiopians. Catfish is stating well-documented facts as thoroughly demonstrated and as well proven as the heliocentric theory or Darwinian macroevolution. Denying that America uses 24% of the world’s energy and that America’s population is 5% of the world’s population is either delusional, hallucinatory, or so disconnected from reality that it can’t be taken seriously. FM will now claim that “these are just random citations from the internet and therefore can’t be taken seriously.” Wrong. These facts are so well documented that they appear everywhere on the web, so FM’s claim that “it’s just random citations from the internet” means that any well-known fact that appears on many different places on the web must be discounted and ridiculed, because it appears on so many places in the web that any internet citation is likely to include so many diverse sources that it can be dismissed as “just random citation from the internet.” That’s tantamount to dismissing as “absurd” facts like “2+2=4” because 2+2=4 is so widely cited on the net that any citation is likely to be “just random links from the internet” — i.e., sufficiently well-known facts have no single definitive source. If I were you, FM, I’d be careful about making these kinds of extreme statements like “IMO most of that is incorrect” and “that’s absurd.” Catfish appears to be making an accurate statement of facts when he mentions that America has 5% of the world’s population and uses (roughly) 1/4 of the world’s energy. That’s not absurd, it’s a thoroughly documented fact. It’s also clear that America’s military power lets us artificially lower the cost of our oil. European consumers pay enormously less than American consumers for gasoline: roughly $8 per gallon, compared to America’s current $3.50 per gallon. The only reason for this is America’s huge military presence in the middle east and our ability to quietly threaten uncooperative oil-producing governments with regime change if they raise the price they charge the U.S. to too high a level. When Catfish talks about the (probably unlikely in the near future) catastrophic fall of the U.S. dollar, the conclusions he draws seem reasonable. It’s simply very improbable that the dollar will stop being the world’s reserve currency and will collapse in value relative to other major currencies to a catastrophic degree anytime soon. There area variety of reasons for this. America has become a safe haven for global investment during the current global economic crisis because of America’s relative economic transparency, our respect for the rule of law, our regulatory safeguards including thorough auditing of all firms and deposit insurance for commercial bank accounts. Compared with, say, China, which has almost none of these advantages, or countries in the southern hemisphere or asia, where the nephew of the prime minister might decide he likes your company and gets the prime minister to confiscate your firm and pay you a pittance, America is likely to remain a much more popular place for the rest of the world to invest for the foreseeable future. So while Catfish’s conclusions given his premises are correct, the scenario he paints with respect to a collapse in the dollar seems unlikely. Likewise, when Catfish remarks that “if oil production permanently drops and if there is no susbstitute, we will return to a pre-industrial level of civilization” is certainly correct if we grant his premises — but once again, these premises seem extremely improbable. It’s wildly unlikley that there will be no substitutes for oil. Changing our transportation to light rail or electric cars powered by, say, solar-electric or nuclear power offers one obvious alternative. And there are many others, including geothermal, tidal power, wind power, and so on. America simply hasn’t developed any other alternative to oil for transportation because our military power makes oil so inexpensive, and because our existing oil distribution infrastructure is so incredibly widespread and so thoroughly integrated into our society, that it would involve a major disruption to change it. For example, cities like Los Angeles simply couldn’t exist in their current form if America were to shift from oil-based personal car transportation to (for example) light rail or electric trams or something of that sort. So Catfish’s statements appear fact-based and reasonable if we grant his premises, but some of his premises seem highly unlikely. They’re low-probability doomsday scenarios akin to the kind of thing James Howard Kunstler churns out. That doesn’t make them “absurd,” just unlikely. But it’s well to remember that $150-a-barrel oil was judged “absurd” until it happened just a few years ago. So we should also be careful about claiming that future events are likely or unlikely. Psychological experiments show that humans are extremely poor at predicting the probability of events, even events whose probability can readily be calculated. See “Are People Programmed to Commit Fallacies? Further Thoughts about the Interpretation of Experimental Data on Probability Judgment,” L. Jonathan Cohen, Journal for the Theory of Social Behaviour, Volume 12, Issue 3, pages 251–274, October 1982. One issue no on e has dealt with so far is the nonlinearity of oil prices and economic oil shocks. As oil prices increase, speculators drive oil prices up wildly. This sends the world into an economic recession, drastically reducing oil demand. When oil prices decline, demand picks up, and oil prices start to rise again. Eventually oil demand reaches the point where speculators drive up prices in wild spikes again, and the whole process repeats. These kinds of increasingtly violent nonlinear price shocks are likely to grow more frequent and more extreme as the world’s oil demand increasingly outstrips available supply. Most of the current growth in oil demand comes from China and the third world: at present, the developed nations show near-flat growth in oil consumption, with the major increases coming from China et al. Also not mentioned is Saudi Arabia’s remarkable recent increase in oil production. Apparently the Saudis increased oil production in 1997 to compensate for the Asian economic crisis, and they appear to be doing the same thing today. This suggests that Saudi production might not be anywhere near its peak. Since Saudi oil reserves and oil production are not publicly available information, this remains speculation, but given the recent global drop in oil prices, it seems likely that the Saudis have recently ramped up their oil production in response to the ongoing global recession. See “Saudis increase oil production by 13%” from 2011. Obviously the goal here is for the Saudis to keep the global economy sufficiently robust to avoid inducing developed nations to find permanent substitutes for oil in the near future. For this reason, I’d have to agree that Peak Oil is probably not here yet, and won’t be in the near future. As long as the Saudis can ramp up production enough to slash gasoline prices in America and boost the world economy, it’s safe to say that we haven’t yet reached Peak Oil. QuadRant makes an excellent point, however, when he notes the extremely long lead time required to transform our societies for a post-oil world. In fact, 50 years probably underestimates the required time. For one thing, America is going to have to knock down and rebuild most of its cities to eliminate the car-centric suburbs and exurbs. We’re going to have to rebuild our cities to accommodate light rail transport. We need much more urban density in places like Washington D.C. and much less tract housing in places like Los Angeles. Significant parts of the United States are going to have to depopulate to prepare for Peak OIl: Phoenix AZ, Taos NM, Los Angeles CA, San Diego CA are not sustainable in their current form. These places all depend on the oil-guzzling personal car and the expenditure of vast amounts of energy in air conditioning, water transport, etc. Absurdities like the Oasis Water Park at the Arizona Grand Resort are completely unsustainable in a post-Peak-Oil world. Much of More’s comment is easily shown to be false. Some is incomplete. Here are a few highlights. Padawan More, you are not yet sufficiently powerful in the Force to say such things. You state some obvious and easily verified facts, then psychically forecast my reaction — incorrectly. The Book says “The wicked argue when no man disagrees.” I fear the dark side gains within you. Catfish said ““Most of us have been quite content to burn through about 1/5 of world oil production with about 1/20 of the worlds population. Military power … have helped make this possible.” It was the last sentence of this with which I disagreed (not the first). Catfish’s reply show that he understood that, and questioned our use of military power, and I replied about our use of power. Nowhere in these 3 long comments is there any discussion about energy use. Your’s is a reading fail. I’ve often done this from reading too quickly, but never so spectacularly. False. Americans pay aprox the same price for gasoline as European’s — before taxes. The US chooses to finance transportation infrastructure via taxes on fuel; Europe does so via other taxes. See the EIA’s data for details. It’s not that simple, for reasons I explained (and you ignore). For details see The falling US dollar – bane or boon?, 14 October 2009. And when we get to that point in 50 – 75 years, my guess is that we’ll not be using much oil. Rising prices, if nothing else, will force that development. “We have the technology.” Or at least the kernals of the necessary technology. It’s not certain; few things in life are certain. It’s another on a long list of things to worry about, a list that’s remained long since we quit being savannah plains apes. Not mentioned where? There are several articles discussing this on the FM website (such as this about the 2008 price spike) and thousands elsewhere. It’s a controversial subject. (a) Not mentioned where? It’s been big in the news. (b) The global recession (gdp<2%) ended in 2009, as it did in almost every nation. Recently a few nations have negative gdp, although growth is slowing almost everywhere. If we’re talking liquid fuels, the US used 21% of world production in Feb 2012. It’s also interesting to note that the latest data shows the US produced 24% of the world’s GDP. So it looks like that energy went to good use eh? Not true. The US now produces some 14 billion gallons of ethanol annually. This is more than 10% of annual gasoline consumption. Also, infrastructure improvements allow for distribution and refueling with ethanol, and also quick charge EV stations. Our local gas station has just recently installed a quick charge station. However, some EVs (Chevy Volt, etc) can be charged with standard 110V outlets that already exist throughout the country. The most important contributors to the world’s total oil production are the giant oil fields. Using a comprehensive database of giant oil field production, the average decline rates of the world’s giant oil fields are estimated. Separating subclasses was necessary, since there are large differences between land and offshore fields, as well as between non-OPEC and OPEC fields. The evolution of decline rates over past decades includes the impact of new technologies and production techniques and clearly shows that the average decline rate for individual giant fields is increasing with time. These factors have significant implications for the future, since the most important world oil production base – giant fields – will decline more rapidly in the future, according to our findings. Our conclusion is that the world faces an increasing oil supply challenge, as the decline in existing production is not only high now but will be increasing in the future. Doomers say a lot of crazy stuff. Hirsch has said a battery powered car was not possible. He’s also said that oil would be $500/barrel by next year. Whenever you read their predictions, it’s best to keep in mind that they’re all nuts. Forecasts that global oil production will soon start to decline and that most oil will be gone within a few decades may be overly pessimistic. The author predicts that by 2030, thanks to advanced technologies, wells will be able to extract half of the oil known to be underground, up from the current average of 35%. Together with new discoveries, the increased productivity could make oil last at least another century. I have known Hirsch personally for many years, and read most of his work. I never heard him say either of those things in print or verbally. Can you provide citations? You are mistaken on several levels. (1) Maugeri is an oil company executive, which makes him an expert of sorts. The article you cite is a basic intro to the subject of peak oil in a general audience publication. (2) Hirsch is an actual scientist, with practical experience in many energy-related fields. He was in charge of fusion (1972-76) and then all alternative energy programs in 1976-77 at the DOE (solar, wind, fusion). Executive at ARCO and BAE Systems. Analyst at RAND and SIAC. Founder of two energy research start-ups, most recently AlumiGen, developing a new method of producing hydrogen for power-generation. Lead author of the DOE-sponsored Mitigations study, the closest thing the US has to an energy policy. Hirsch did predict oil would be $500/barrel sometime between 2011 and 2013. Hirsch also said that people wouldn’t be able to afford new vehicles (including electric cars), after oil production goes into decline, which he predicts will happen between 2012 and 2015. 20/20 John Stossle makes the case that the peak oil theory is a Myth. “We hear over adn over the world is running out of oil”. Lesley Stahl meets with officials in Saudi Arabia and takes a tour of its vast petroleum facilities, which are gearing up to produce even more oil. Lesley Stahl takes an inside look into the world of Saudi Aramco, the world leader in crude oil production and the country’s sole source of wealth and power. 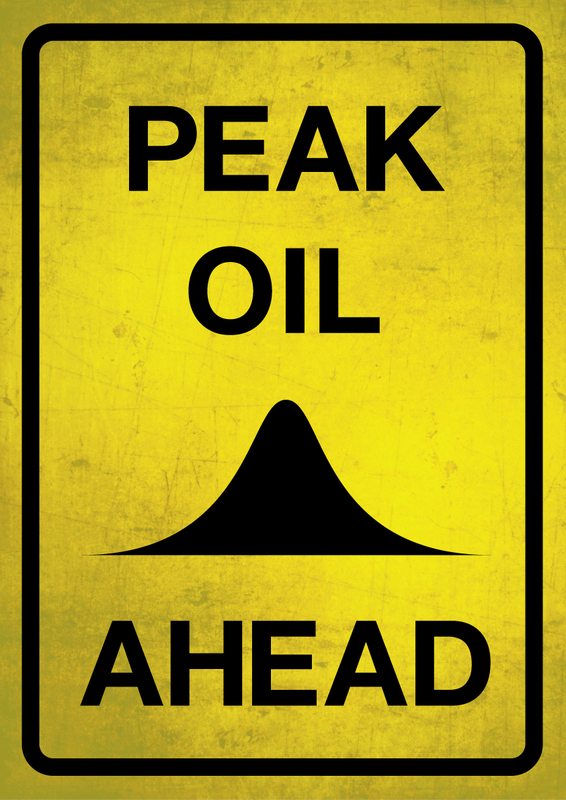 Peak oil is either a myth, or a failed theory. Take your pick. It’s too great a task to sort through all this misinformation. I’ll hit a few high spots. But first, a poll for readers. Is John B yet another indoctrinated conservative, misinformed after a careful diet of misinformation by right-wing news media, publications, and websites? My guess (emphasis on guess) is “yes”. Perhaps he’ll tell us. Both false. The video clearly states that this is a “worst case” for the next 3-5 years (probably taped in June 2008). He also says that forecasting such things is very difficult. Most estimates for peak oil were moved out in time due to the global recession which started that summer, probably the worst since the 1930s. Forecasting peak oil is sensitive to such variables. False. He said nothing like that. He might be correct. Since we have not hit peak oil, we can only guess at the consequences. Also, many economists believe that new cars are already borderline unaffordable for most Americans. The most recent available Fed data shows the average new car loan is $27 thousand for 62 months, at an 80% loan to value ratio (which means half are even less prudent). This is imprudent, and has resulted in many Americans with cars having negative equity. Brilliant. He got his BA in 1958, so he’s probably in his mid-70s. He is still active, however. He was a senior manager for Exxon and ARCO for 14 years. Plus he was considered sufficiently expert to do lead national-level oil research for RAND, SIAC, and the Department of Energy. Plus that peer-reviewed research. But I mentioned all this, and you didn’t hear it the first time. It’s not a myth, since the amount of oil in the ground is finite. Every major science and energy institution I’ve seen (eg, EIA, IEA, IPCC) says that production will peak; they differ as to the time of peaking. Some estimates are soon; some are as much as 40 years away. As Hirsch says in the above interview, we don’t have the data for an accurate forecast. However, peaking often occurs unexpectedly even in well-studied oil fields. When Ghawar peaks, the world probably peaks. It’s not a failed theory, since forecasts of peaking lie in the next two-plus decades. (6) Rex Tillerson does not support your weird belief. 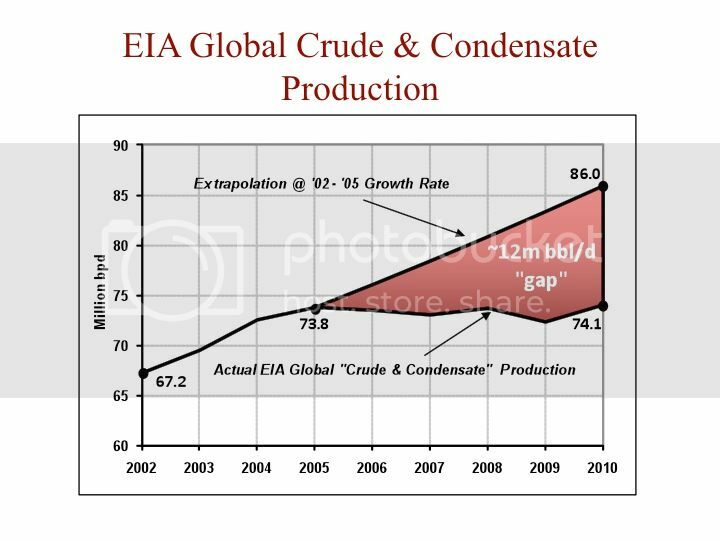 In the video he said (in 2008), as most experts said then (including Hirsch) that oil production was not peaking at that time. He said — as does this post (and every expert) that oil reserves were large, and that oil would not “run out” in the next two generations. As most articles on the subject explain, peak oil is not “running out”. What’s the matter Fabius? You can’t argue with experts, and facts, so you have to edit the links? And IIRC, propaganda is the realm of the looney left. The looney left LOVES peak oil BTW. What a perfect Luddite, Eco-Nazi, pipedream peak oil is indeed. Keep wating for that Great Pumpkin Charlie Brown! I must admit though, I’m not really sure if peak oil pundits are really that delusional, or just good liars. E.g. Simmons’ made up, on-air BP stories whilst shorting the stock. You probably have HIS book on your shelf as well eh? Like someone said, “there’s a sucker born every minute”. I copied the descriptive information from the YouTube entries. Providing full citations is a courtesy to readers. Before taking the time to watch a link, people are entitled to know what the video is about. Yes. And of the looney right. I’ve documented this at great length, as have many others. Agreed. I’ve written several posts about this, such as Peak Oil Doomsters debunked, end of civilization called off. Almost every single statement of John B has been easily proven false, all of which he ignores. He cannot even quote correctly from the links he posts. Yet he remains untroubled, convinced of his truths. He easily dismisses the entire body of research on peak oil — and the conclusions of every major energy-related institution and almost every energy expert. To make a generalization from the 20 thousand comments on the FM website, there is a difference between the indoctrinated members of the left and right. When those of the far left have their statements refuted, they tend to leave. Those of the far right remain longer, ignoring the evidence and producing more misinformation. If that’s the case, then he shouldn’t be making predictions. Not only has Hirsch made several failed predictions, his report from 2005 has included several failed predictions from various other peak oil nutters. A rather confused bunch wouldn’t you say? It’s nice of you to demonstrate the accuracy of my characterization of indoctrinated conservative commenters, and how each disproof of their misinformation is met with anouther round of nonsense. We’ve been good sports about this, but — you are welcome to post information, but enough of the insults and making stuff up. (1) You have not shown any false forecasts of Hirsch (although, like every energy expert, he’s probably made some). Please read about probabilities and tail risks. (2) The team that wrote the Mitigations report did “research”. They listed the full range of peaking forecasts, from 2006 through 2025 — and beyond. (3) Making public policy very often requires estimates of things that cannot be reliably forecast. That’s the basis for almost all work on shockwaves (ie, low probability – high impact scenarios). That’s life. Good experts make the public aware of the uncertainties, then describe the risks (that’s why they’re called “risks” and not “certainties”). With peak oil, the risk is that peaking will arrive unexpectedly — as it has for major fields like Cantarell in Mexico, where the decline was recognized only afterwards — followed by a short peak (or none) and rapid decline (eg, North Sea, Cantarell). Should this happen with Ghawar the effects on the world economy would be painful. Note CO2 injection starts on Ghawar next year — sometimes a sign of an aging field, and associated with rapid post-peak declines. The (failed) Hubbert theory includes a “peak”, and then a “decline”. A “decline” would mean someone, somewhere has “run out”. I’m sure that’s what Mr. Tillerson was referring to. Peak oil nutters like to play tricks on words with their various explanations of the failed theory. Take a quantity. Reduce it by 6%. Come back and tell us in how many steps it goes to zero. (aka “runs out”). Unlike you, Tillerson understand simple math. For more information look up logistics curve. Last warning. No more insults and making stuff up. It’s the behavior of a troll, and if continued future comments will be moderated. IIRC, a number of gas stations did “run out” after the 1973 Arab Oil Embargo. The peak oil theory (as put forth by Hirsch and various other nutjobs), would involve declines in production that would make the situation about 1,000 times worse than 1973. Hirsch openly talks about public panic. As did Simmons. I very much doubt there would be panic if nothing “ran out”. That was a stupid comment. I’ve pushed the troll button. Your future comments are moderated. Reasonable ones will be posted. (1) We’re discussing peaking of global oil production, and the forecasts given by a logistic curve. It’s typical troll trick to mention what happened to some gas stations in the 1970s. (3) Again, John B proves incapable of correctly quoting his own video (CNBC interview in 2008). In response to a question about what might happen during the next ten years, Simmons gives a worse case scenario (not a prediction in the usual sense of the term): if the government elects to lower prices by drawing down inventories, a future shortage might result in panic hoarding. And a paralysis of the transportation system — and food shortages. It’s possible, but IMO absurdly far-fetched. It’s the sort of attention-getting story investment bankers tell. Note that the economic impact of the higher prices was different, but in its own way catastrophic. As I wrote in early 2008, high oil prices helped initiate debt deflation — leading to the global great recession. Which in turn knocked down the finance bubbles around the world (eg, US, Ireland, Iceland, Spain) — and might knock down the European Monetary System.